Adoption had always been a dream; a dream my husband and I discovered we shared while dating. Then I went to Africa. As I worked with vulnerable children the deep desire to be a family for a child who didn’t have one grew in both of our hearts. We set out to get some experience, raise some biological kids, and then weave adopted kids into our established family somewhere down the road. Then unexplained infertility changed our plan. One night we prayed together and realized that while we could wait for optimal conditions to add children to our life, the kids who needed families could not. They still had birthdays, bedtimes, class field trips and colds. They needed a family NOW. We pursued adopting from foster care in the “under six year-old” category because we were young and it just made sense. I didn’t expect my first child to come to us at twelve years, or that she would be almost as tall as me. I was 25, and there she stood, a mere thirteen years younger than me. When the call came in asking us to consider fostering a girl coming from a disrupted adoption, I felt immense peace. We knew she liked reading and horses, but that was it. Even though it was outside of the scope of our expected parameters we knew it was right, and we knew it wouldn’t be easy. We signed up for “up to a year” timeframe so that she could decompress and heal from the disappointment of not being folded into the previous family she had anticipated. I am her sixth mom, and she is my first, and currently only, child. She showed up on our porch in a DHS vehicle packed with stuff accumulated over almost four years in foster care. She walked in, her eyes darting around, assessing the new environment. I was very nervous. We stood awkwardly in the door between the living room and the kitchen, and I asked her what she wanted to call us. First names were good to start out. As she started school, I asked her one day why she didn’t join choir. I had heard that she liked it, and I knew she loved singing at church. We had also enjoyed singing at the top of our lungs together in the car whenever we would run errands. “It’s just not my first priority,” was her reply. I inquired further and asked what her priorities were. Her answer shook my soul, “Getting out of foster care.” This beautiful, spunky girl didn’t allow space in her life to enjoy things because she was so worried about what might happen next. On a particularly bad night when she did everything she possibly could to push us away, we decided that we were in this for the long haul. We would NOT stop loving her. No matter what. She needed someone to not give up. She needed a place to be herself. A place she could feel at home and learn to trust again. We decided that we would act like she was never leaving, even though we were only her foster parents at the time. It has been two years since she came home, and her adoption was finalized six months ago. I am constantly blown away by how perfectly she fits with us. Some days I just can’t believe this is my life. I’m a mom to a freshman in high school. My husband and I will be 31 when she graduates. And although things aren’t always easy, I’m so glad for this life with her. We are beginning to start the process of adoption again, hoping that we can be one united family before she goes to college. Whenever I look at the adoption profiles, the older kids get me. Sure, the little ones are cute, and I would love to experience baby stages. But the kids who might age out, the ones that are “hard to place,” or are connected to many siblings who all need one home, rock me every time. I cry over the kids who are moving into apartments at only eighteen and have nowhere to go at Christmas. Holly Hawes lives in Oregon. She is wife to Josh and mother to a teenage daughter adopted from foster care. They hope to adopt again soon. 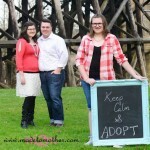 You can follow the Hawes’s adoption journey at their blog, Called to Restore. Holly, you are such an inspiration. I love reading your blog.